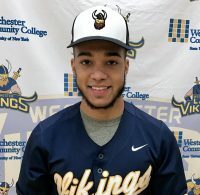 Westchester third baseman Steven Figueroa (Bronx) was named NJCAA Region XV Co-Player of the year. Anthony Shkrelja (Fox Lane HS) was named NJCAA Region XV Pitcher of the year and Viking Coach Billy McClure was named NJCAA Region XV Coach of the year………….Steven Figueroa 3B (Bronx), Mark Shkrelja OF (Fox lane HS), Anthony Shkrelja RHP & 2B (Fox Lane HS), Henry Pizzutello RHP (Stamford Ct) and Joe Boscia 1B (Eastchester HS) were voted First Team All Region XV NJCAA. Ryan Mordecai P (Carmel HS), Austin Pollack OF (Harrison HS) and Steve Hill DH (Carmel HS) were named 2nd Team All Region XV……..Former Viking John Fussell (Briarcliff HS) batted .270 with 3 homeruns while playing the outfield for Stetson U. Former Viking Jessica Smith batted .290 in 12 games for SUNY Purchase this season.